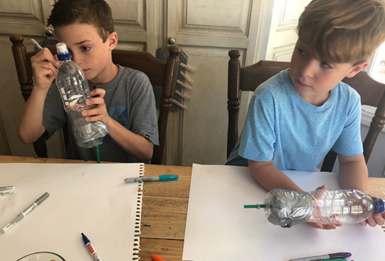 Step 2: DRILL A HOLE IN THE BOTTOM OF THE BOAT – THEN PUT A STRAW IN IT. 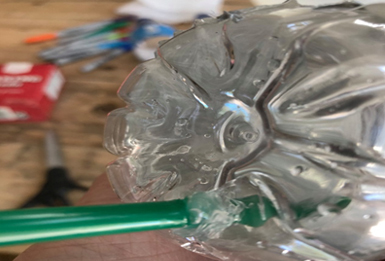 Using a drill or soldering tool, make a small hole (the size of a straw circumference) in the bottom edge of your plastic bottle. Caution: Wear safety glasses—and keep small kids at a distance—to make sure bits of plastic don’t fly into your eyes). Step 3: FILL IT UP & WATCH IT GO! Turn the bottle sideways and cover the straw end with your fingertip while you pour about 1 cup of vinegar into the bottle. Then, keeping the bottle flat and the straw side up (so nothing spills out), drop a few spoonful’s of baking soda into the bottle. Make sure to keep the baking soda on one end and the vinegar on the other. 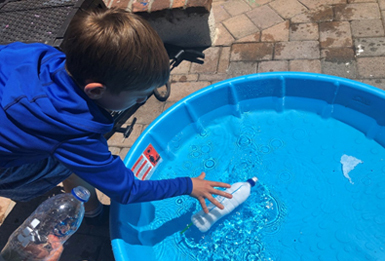 Give the bottle one quick shake and place it quickly into your pool or tub. And it’s off! THE SCIENCE TO IT: WHAT IS HAPPENING? 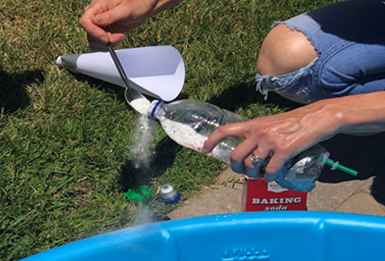 Does more baking soda change how fast the boat moves? Does more vinegar change anything? What about how you combine the ingredients? For instance, does a quick shake help thing move? Or a slow fizz?